The Delaware Valley Soft Coated Wheaten Terrier Club (DelVal) began as a small group of enthusiasts dedicated to their Wheatens who lived in the northern Philadelphia suburbs. Today our club has members throughout Pennsylvania, Delaware, New Jersey, New York, Connecticut, Washington DC, and Virginia. Whether you are new to the breed and are looking for information on Soft Coated Wheaten Terriers or an old friend to the breed just to check to see what is happening, we hope you enjoy your visit here. For more information go to our parent site Soft Coated Wheaten Terrier Club of America. 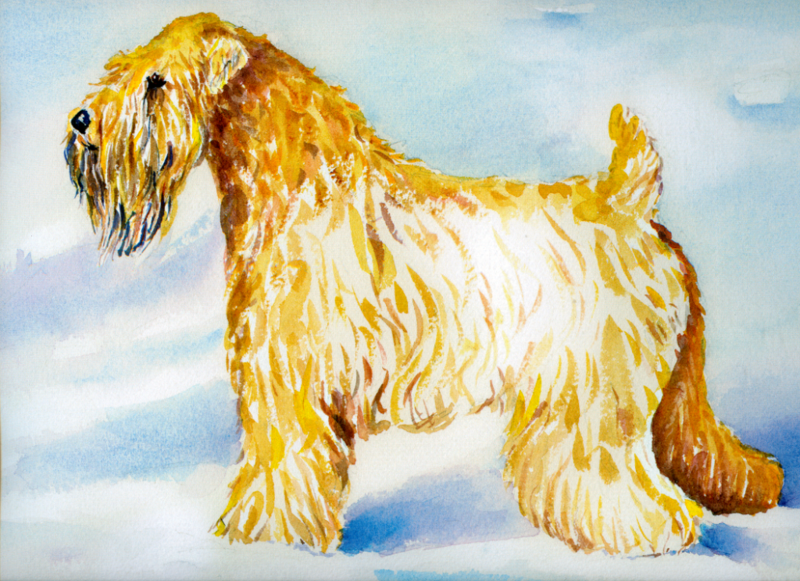 The watercolor above “Casey In The Snow” by a founding member of DelVal, Marjorie Shoemaker, is of her Ch Abby’s Postage Dhu O’ Waterford who was the first Wheaten to gain the AKC American Championship title. More art and photos of Wheatens can be seen throughout this site.